This was by far the most fun project of the year. My partner Anna & I enjoyed collaborating our ideas in the design process, to actually constructing the Light Timber Model and seeing the final finished product. The following documents the entire process from start to finish. It all started when Anna & I joined forces. Right from the start we had similar ideas of the aesthetic we wanted to achieve in our design. We started to share ideas and create parti drawings, and eventually came up with a concept we were happy to stick with. 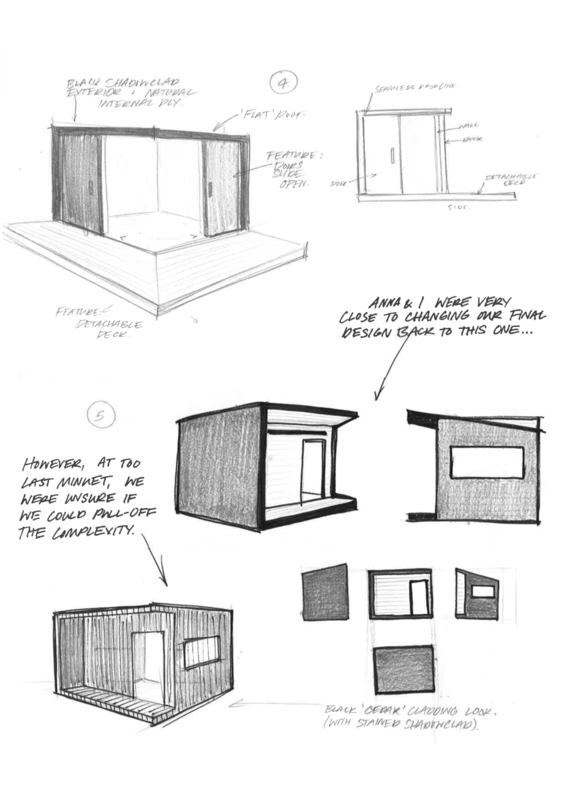 When it comes to developed design, I like to create a quick Sketch-up model to give a clear, proportioned idea of what the design is really going to look like - before moving forward to CAD modelling or working drawings. Below shows the agreed-upon concept that we planned to take through to construction. We refined our Developed Design further to produce the model below. We realised the idea of nailing each individual plank of timber to form the exterior horizontal cladding was time consuming and not as weather-tight, compared to utilising the humble, sustainable, and overall efficient Shadowclad. Staining it black gives a cleaner, 'finished' look, while still highlighting the natural timber we initially wanted to feature.